I haven't researched your guitar but I can tell you at first sight it is not an early 70's Aria. 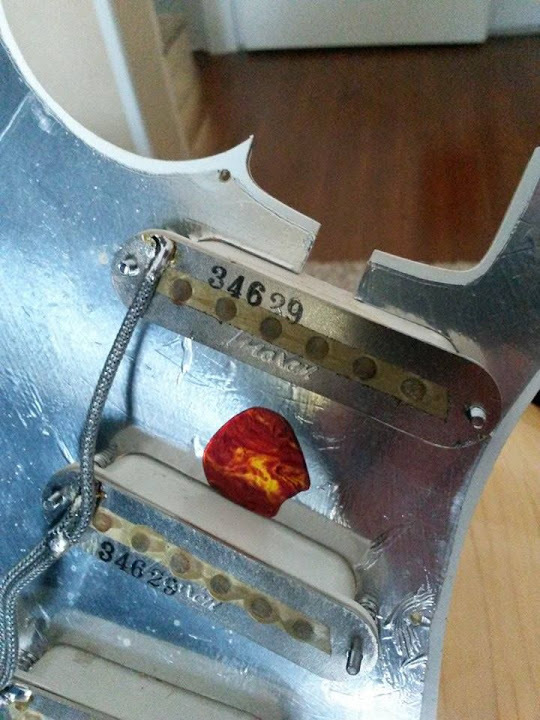 Most 1970's Aria Strats had a large truss rod cover screwed to the headstock. The filled truss rod hole on you instrument didn't appear until 1977-78. My first impression is that your Strat was built by Matsumoku sometime between 1978-81. When I get some time, I'll do some more research and get back to you. You can also subscribe to the VintAxe Catalog Library and likely figure this out on your own for the bargain price of $10. I have loads of Matsumoku built Stratocasters under a variety of brand names in the Asian electric guitar section of the Library. Aria A1723T also has the same guitar but the kits and the color is different, and the neck is rosewood. From this it is concluded that my guitar could be A1723TD Deluxe but I could be wrong. from a '73 "LAWSUIT ERA" Strat! "Maxon (Nisshin Onpa) started out in the mid 1960s as a guitar pickup manufacturer. Nisshin Onpa has manufactured pickups for Aria, Ibanez and Greco guitars. The Ibanez "Super 70" and "Super 58" pickups and also the Greco "U-2000" and "Dry Z" pickups were made by Nisshin Onpa. In 1969 they also became an effects pedal manufacturer, primarily as a producer of OEM products for other companies. " "Greco and Ibanez Nisshin Onpa (Maxon) pickup serial number format consisting of 5 numbers up to and including 1977. Ibanez Super 70 pickups have the same serial number format. Greco and Ibanez Nisshin Onpa (Maxon) pickup serial number format consisting of 6 numbers from 1977 to 1982. Fifth and sixth number = Day of Month (01-31) "
Given the Maxon pickups, this is probably a Fujigen Gakki built guitar rather than Matsumoku who built most Aria branded instruments. You can see many Fujigen built Stratocasters from the 70's if you look under the brand name Greco and Westminster in the VintAxe Catalog Library. No one has been playing guitar for over 30 years so I forwarded the guitar for service, if it is put to good playing condition. Amfisound is an excellent guitar repair and construction workshop. Westminster were built by Matsumoko were they not? Anyhow,from what nI have been able to find out this is a Matsumoko built guitar, its in the 1972 Aria catalogue, its an Aria 1723TD , quite a rare old thing, I have only seen 3 examples on the internet and I have searched hundreds of pages. One of those examples is mine. The fretwork is nothing short of brilliant, small vintage frets , 7.5 radius, large 70's fender type headstock, lovely quality Gotoh tuners, truss adjust at the heel, neck is thick but not too thick, its a work of art the necks on these guitars. The electrics on mine are different, so mine might be an earlier one, my serial number points to 1971. Odd pot values, tone pots are 500k , volume is 1M. There is no noise what so ever from this guitar, normally most single coils I have had buzzed, this one is dead silent. The trem block is a big lump, weighing in at nearly 400 gramms. Im not sure if its chromed brass or just a solid lump of steel. These were not cheaply made guitars, everything about them is quality. The body is 5 parts on the back, 4 on the front, like a 4 piece cap, Im not sure why they did this, alternating grains for stability perhaps? The whole thing weighs in at over 9 pounds, so its a big lump of a guitar. Routing is first class, it really is flawless, its as if they fine sanded the cavity's, a fairly thick poly coat that's turned this lovely dark honey colour. The build quality is superb, hardware and electrics are all top notch, it sounds and plays fantastic, really nice clarity. Its only flaw is the three position switch, but thats easily sorted, and its weight but thats something a person can get used to. Im not a big lover of Strats, in fact I struggle to play them, but when this came up for sale I wasnt going to pass it up.